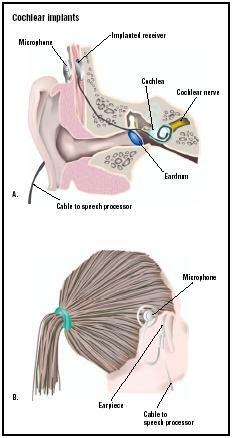 A cochlear implant is a small, complex electronic device used to treat severe to profound hearing loss. It is surgically implanted underneath the skin behind the patient's ear. A cochlear implant delivers useful auditory signals from the environment to the patient by electronically bypassing nonfunctional parts of the ear and directly stimulating the auditory nerve. Unlike a hearing aid, it does not merely amplify sound. Instead, an implant increases the amount of nervous response to sound. Although it does not restore normal hearing, the additional input provided by the implant often improves sound detection and increases speech understanding. Normal hearing occurs because sound travels from the outer ear into the ear canal and vibrates the eardrum. The vibration is carried through the middle ear by three small bones attached to the eardrum and on to a fluid-filled part of the inner ear called the cochlea. Movement in the cochlear fluid is transferred to hair fibers within the cochlea. The movement of these hair cells stimulates nerve cells called ganglion cells that send an electrical current to the auditory nerve. In turn, the nerve carries the current to the brain, where the electrical stimulation is recognized as sound. A common cause of hearing loss is damage to the hair cells within the cochlea. This kind of deafness, called sensorineural deafness, can often be treated with cochlear implants. This is particularly true if damage to the hair cells is not accompanied by damage to the auditory nerve itself. As of 2002, it is estimated that over 35,000 individuals have received cochlear implants. Cochlear implants consist of internal and external parts. The external parts include a microphone, a speech processor, and a transmitter. The internal parts include a receiver-stimulator and an electrode. Some models include a small headpiece that is worn just behind the ear and contains all the external parts while other models also use body-worn modules that are placed in a shoulder pouch, in a pocket, or worn on a belt. The convenience of the all-in-one headpiece is balanced by shorter life for the batteries used in the smaller units, although systems using rechargeable batteries do solve some of these issues. Within the headpiece, the microphone picks up sound in the environment. The speech processor converts these sounds into a digital signal. The content of the generated digital signal is determined by the programming of the processor and is complex. It includes information about the pitch, loudness, and timing of sound signals and attempts to filter out extraneous noise. The transmitter converts the digital signals into FM radio signals and sends them through the skin to the internal parts of the implant. The transmitter and the internal parts are kept in correct alignment by using magnets present in both the internal and external parts of the device. The internal parts are those that are surgically implanted into the patient. The receiver-stimulator is disk-shaped and is about the size of a quarter. It receives the digital signals from the transmitter and converts them into electrical signals. A wire connects the receiver to a group of electrodes that are threaded into the cochlea when the implant is placed. As many as 24 electrodes, depending on the type of the implant, stimulate the ganglion cells in the cochlea. These cells transmit the signals to the brain through the auditory nerve. The brain then interprets the signals as sound. The sounds heard through an implant are different from the normal hearing sounds and have been described as artificial or robot-like. This is because the implant's handful of electrodes cannot hope to match the complexity of a person's 15,000 hair cells. However, as more electrodes are added, electrode placement issues are solved, and the software for the implant speech processor takes into account more and more aspects of sound, the perceived results are moving closer to how speech and other sounds are naturally perceived. deaf community, while at the same time not feeling fully a part of the hearing world. The decision to undergo cochlear implant surgery is a complex one and a person should take into account the risks and realistic rewards of the device. The procedure can be preformed on an outpatient basis for adult and adolescent patients. With children, it is often performed with a one-night stay in the hospital. The internal parts of the implant are placed under the skin behind the patient's ear. The area is shaved, although newer procedures allow for sterilization of the hair in the area so less shaving has to occur. Once the sterile field is established, the surgeon makes an 2–3 in (5–7.6 cm) incision behind the ear and opens the mastoid bone (the ridge on the skull behind the ear) leading into the middle ear. A depression is made in the bone next to the opening to allow the receiver-stimulator to sit flush with the skull surface. After seating, the receiver-stimulator is held in place with a long-lasting suture. The surgeon then goes through the opening in the mastoid bone to create a new opening in the cochlea for the implant electrodes. The electrode is then very slowly and careful threaded through this new opening. Care is taken during the procedure, and the electrode structure itself is designed to align the electrodes as closely as possible to the ganglion cells, as this allows the electrical signals that function to be less powerful. Once in place, the device is tested to be certain it is working. If all is well, the surgeon then closes up the incision with absorbable sutures, so the area does not need to be revisited to remove the stitches. The entire operation takes between one and two hours, although the procedure is more complex for younger patients due to the smaller size of their middle ear structures and tends to take longer. For a short period of time after the surgery, a special bandage is worn on the head during sleep. After about one month, the surgical wounds are healed and the patient returns to the implant clinic to be fitted with the external parts of the device and to have the device turned on and mapped. Mapping involves fine tuning the speech processor and setting levels of stimulation for each electrode, from soft to loud. The patient is then trained in how to interpret the sounds heard through the device. The length of the training varies from days to years, depending on how well the person can interpret the sounds heard through the device. However, it should be noted that serious surgical complications have been observed at only one in 10,000 procedures of this type. Some long-term risks of the implant include the unknown effects of electrical stimulation on the nervous system. It is also possible to damage the implant's internal components by a blow to the head, which will render the device unworkable. A further consideration is that the use of magnetic resonance imaging (MRI) for patients with cochlear implants is not recommended because of the magnets present in the devices. Several companies have developed implants that do not use magnets or have altered the receiver-stimulator make up to make it easier to remove the magnets before testing. One fact that reduces the concern about MRI testing is that for many medical indications, MRI can be replaced with a computer assisted tomography scan (CAT or CT scan), which is not a problem for persons with cochlear implants. Additionally, in July 2002, the Food and Drug Administration (FDA) issued a warning about a possible connection between increased incidence of meningitis and the presence of a cochlear implant. This warning included special vaccine recommendations for those with implants, as well as the voluntary removal from the market of certain devices. Specifically, those implants that included a positioner to hold the electrodes in place in the cochlea appear to be associated with an increased risk of the disease. Most profoundly deaf patients who receive an implant are able to discern medium and loud sounds, including speech, at comfortable listening levels. Many use sound clues from the implant, together with speech reading and other facial cues, to achieve understanding. Almost all adults improve their communication skills when combining the implant with speech reading (lip reading), and some can understand spoken words without speech reading. More than half of adults who lost hearing after they learned to speak can understand some speech without speech reading. Especially with the use of accessory devices, the great majority can utilize the telephone with their implants. Children who were born deaf or who lost their hearing before they could speak have the most difficulty in learning to use the implant. Research suggests, however, that most of these children are able to learn spoken language and understand speech using the implant. In general, the earlier the implant occurs the greater the chance of the implant providing sufficient sound input to provide speech understanding. As with the use of the telephone in adults, accessory devices such as special microphones often help the function of the implant in classroom settings. Christiansen, John B. and Irene W. Leigh. Cochlear Implants in Children: Ethics and Choices. Washington, DC: Galladet University Press, 2002. Niparko, John K., ed. Cochlear Implants: Principles and Practices. Philadelphia: Lippincott, Williams & Wilkins, 2000. Cheng, Andre K., et al. "Cost-Utility Analysis of the Cochlear Implant in Children." Journal of the American Medical Association 284, no. 7 (August 16, 2000): 850–856. "The Earlier the Implant, the Greater the Benefit." The Hearing Journal (February 2001). Mraz, Stephen J. "Breaking the Wall of Silence." Machine Design (December 9, 1999). Alexander Graham Bell Association for the Deaf. 3417 Volta Place NW, Washington, DC 20007. (202) 337-5220. http://www.agbell.org . Cochlear Implant Club International. 5335 Wisconsin Ave. NW, Suite 440, Washington, D.C. 20015-2052. (202) 895-2781. http://www.cici.org . Hearing Loss Link. 2600 W. Peterson Ave., Ste. 202, Chicago, IL 60659. (312) 743-1032, (312) 743-1007 (TDD). National Association for the Deaf. 814 Thayer Ave., Silver Spring, MD 20910. (301) 587-1788, (301) 587-1789 (TDD). http://www.nad.org . Cochlear Implant Recipients may be at Greater Risk for Meningitis. FDA Public Health Web Notification. October 17, 2002 [cited February 23, 2003]. http://www.fda.gov/cdrh/safety/cochlear.html . Cochlear implants are inserted during a surgery performed by a specialist in otolaryngology (ear, nose, and throat medicine). The surgery is performed in a larger hospital, usually as on an outpatient basis, but sometimes with an overnight hospital stay. How "normal" will the implant make my/my child's hearing? What kind of training does the patient undergo to learn how to use the device? How do I care for the device? I am a patient with a cochlear implant. I want to know how they did the surgery. I am going information on it and how I can live and hear with an implant. Rebecca... how do you hear now with the implant? I am doing a research paper for school involving cochlear implant and children. I, myself, have a deaf son and have never given him the implant. is there a side effect of nose bleeding from surgery ? I have got implants done for my 1yr 3 month old daugther and she started bleeding after three days of the surgery, yesterday. Doctor investigated and said nothing to worry but we are still concerned and just wanted to see if some one already have experienced this. My Son had a cochlear implant about 20 years ago,3m cochlear implant/house design. the wire from the implant is now coming through his ear drum and has infection coming from his ear. Has anyone had these symptoms and what did they do? That would be an Oral Surgeon. When a job is too big for the ruelgar dentist they'll usually refer you to one. Ask the oral surgeon for advice on what type to get. I am going to be evaluated for an implant. Does anyone know of a surgeon in the Orlando area? I am a veteran and patient at john dingell va medical center in detroit michigan.in sept.2003 i had an inner ear infection called viral labyrintitus.the physicians i had diagnosed me with me acute otitis media and an earache.they prescribed me an antibiotic.i couldnt understand why i wasnt getting better with it.i had to diagnose myself with the symptoms i had on the internet.no one even diagnosed me correctly.the physicians i had didnt sit down with me as they should have only 10 minutes.i have a chunk moving around in my cochlea inner ear and my pinna turns red everyday.if you are a ent surgeon or a otologist or a neurootology or a surgeon with microsurgery skills i need a inner ear transplant or a cochlea.it has been done and the inner ear is transplantable.i have lived with it for 10 years.if you can assist in medical care would you contact dr.amitha parvateeni firm c 1st floor dingell medical center detroit michigan.there should be university hospital that can do this.you may contact also dr.ho sheng lin chief of otarolgy.dingell medical center detroit mich. vamc.thankyou.from mr.g waite. My father he has a hearing problem...we r looking forward for cochlear implant surgery..He is almost 67 years...Does it work? and what will be the overall medical cost for this surgery...If any one experienced this treatment plz let me know the merits and demerits about it...Thank u.
I was born with a loss that wasn't diagnosed for nine years. I watched the evolution of the implants and was concerned that one day, I'd be faced with the decision - be deaf or process sounds. Allow me to address Santhi. I was almost a senior when I opted for surgery. My spouse and I studied the three U.S. FDA-allowed companies. Most of the information was marketing and I attempted to dig into the reality of what could occur. I'm tough (usually) and I was not prepared for this. But one of the reasons of not being prepared was due to the misinformation and data scrubbed responses from people on various forums. I worked in IT and know data scrubbing. When someone commented on a forum (she was afraid of surgery was met with a simple response from me that I was too, was removed by the moderators after sending me a not to remove it... that's all it was. The site was created by one of the three companies here and they obviously didn't want anything remotely negative on it. I found it deceptive and within their right to remove it and I never touched that site again). It has been a year since receiving the processor gear on the outside of my head. I had to relearn sounds and I'm far from doing that. Since the implant removes sensori-neural AND (I didn't think of this) bone conduction, there's no residual hearing and it's creating issues. The implant isn't flush against my head, so it's too difficult to wear the external piece behind my ear. I wear a clip on my shirt. A side-effect not mentioned is tinnitus. I had it to an extent prior to surgery but it is greatly compounded now. I feel the dreadfully expensive device works better as a mask (to dull some of the tinnitus) rather than an aid to process sounds. I cautioned people about it on a forum about removing comments and again, I was attacked and was told I was lying and I was not. I hold the upper-hand here because again, 30 years in the computer field made it clear to me what was going on. People say you can wear glasses with it. When I said I could not on one forum, I was attacked. I have wire-frame glasses and had avoided using them. They do not work for me without pain because the implant bulges so much in back of my ear. At this time, I'm waiting to learn if the implant can be surgically altered so I can see (wear glasses). If I had plastic (thicker-frames) glasses, I would be totally lost. Santhi, Everyone's head and brain is different. I would say it didn't work for me and if I can find out if insurance will pay for the removal, that will happen. No one can say how your dad will be and I'm close to his age. I just caution you to ignore the marketing material and he should understand he will not hear sounds but process them (there's no hearing because sounds are transmitted through the brain) and recognizing music ... I don't know. I can't and music was an integral part of my life. The cost will vary depending on your location, the surgeon, and the hospital. Also, the warranty may only be 3-5 years for something that in my case on one ear for surgery, the device, and audiology adjustments was well over $50k. There are absolutely people in my age bracket who have had help due to the implants. I'm not one of them (and using the phone is impossible right now). Please, website masters, allow this to remain. There is so much bad information about implants floating around that it's mind-boggling. Can anyone tell me about the after effects for a long term basis? How it gonna effect person normal life activities like having a shower, swimming or any playing any other game? Is there any risk of effecting brain or anything else during/after surgery?? My younger brother is planning to have this surgery very soon, so please urgent response will be highly appreciated. My great niece ( 15 yrs old ) has a cochlear implant since she was 5. . She is in the hospital with meningitis. This is the 4 th time . She is suffering on 3 heavy duty antibiotics ( can't eat , severe stomach pain , headaches , backache . The drs are not doing much . She was vaccinated a few years ago for meningitis & still got sick . We don't know who to turn to . This is in NY state . The CDC , FDA , New England Journal of Medicine all have reports on the web stating "cochlear implants can cause meningitis in children" had we known this 10 years ago, we would never had opted for the cochlear . Now the dr does not want to remove the implant stating removable will cause spinal fluid leakage . Someone ( Please Lord ) help us !!! Has anyone here had Bell's Palsy while using a cochlear implant? If so, did you experience any change in hearing on the palsied side? I used to have 75% speech recognition in my implanted ear, but after incurring Bell's Palsy, my speech reception is only 30%. Oddly, the palsy amplified the sound I receive, but the new loudness distorts language, diminishing my comprehension of speech. Any info from other Bell's palsy patients would be greatly appreciated. I got a cochlear implant in my 60's & find that I can follow slow speech reasonably well IF I can also speech read - not exactly what I was expecting, but better than relying on the written word for incoming communication! My mom had the implant 3 months ago, she is 82 and has meniere''s disease and was completely deaf in her right ear and about 75% deaf in her left ear. She is having a lot of problems with her implant! She has days she cannot hear nothing and on the days she does its nothing but jumbling words and it is driving her crazy! She is NOT the same person she use to be, she is depressed all the time, doesn't go anywhere and if she does she sits in the car, she doesn't want to be around people because she can't understand what they are saying, she used to go to church and doesn't even go there anymore! She wishes she had NEVER had the implant, she says her hearing is worse now than it was before! She goes to her audiologists in Augusta, Ga. on September 14 for her first hearing test since the implant so I guess we will just have to see if there has been any improvement! I pray every day and night that she can get some of her hearing again or at least to be able to hear words, but it seems like she is getting worse! If she had it to do all over, she would not have had the implant! Please let me know if my son is a candidate for any other surgery. Hearing aids did not work cochlear implant did not work so he had to have it taken out. Is there any chance that he can have surgery on his opposite ear? I just had my third implant last week. The first one went fine. We all cried when the tech turned me on and I could hear. Lasted almost three years. To back up a little. I have been deaf in my left ear since I was 9 so my right ear did the work for both. In 2012 I was sitting watching tv and then everything sounded like I was under water. I'd been having trouble with it anyway but this was not normal. I wore a hearing aid for years but it was getting worse and I was at my limit on those working. So it got worse over the days. Then about a week later my doctor calls me to inform me that I have breast cancer! Double whammy!! My ear doctor says I need to get a cochlear but I can't do it until I get through my cancer surgery and treatments. I go through that not being able to understand what anyones saying or being able to understand much of anything. Thank you closed caption. Go forward back to the implant. Like I said the first one went fine except the Dr. put it too low and it slipped behind my ear. So I go to a better Dr. And he repositions it but when I go to get hooked up everything sounds garbled. They do a CT and see the electrode had pulled away a bit and that's what was causing me to hear like that. So surgery # 3 now I'm into it a week later and just waiting to get hooked up again. I sure hope it works because without it the noise will drive me crazy. I don't want to go through the rest of my life deaf. I can't read lips and I have to talk to my husband on my iPad app called dragon. Having that implant was the best thing I could have done. No, it's not perfect. Most music sounds terrible now. I really miss that. But just being able to hear and understand as much as I could was a blessing. If you need it get it. It's worth it. Good luck to anyone who is thinking about doing it. It is very expensive though so I hope you have good insurance. Why oh why do hearing parents who know nothing about deafness continue to force surgery on a tiny baby or child...this amounts to child abuse. Stop listening to the doctors and "specialists" who want your money and to "fix" the deaf. Deaf culture is awesome, sign language is beautiful, stop trying to make your child "normal"...what the hell is normal anyway??? Implant on sister was on July 5th, have gone through hell ever since, I would NOT recommend this for anyone, you have no Idea of what will happen. She came out of surgery with parallelizes of the face on the side of the implant, Eye would not shut, mouth drooping, weeks go by, treatment of eye drops every hour and ointment, then eye sewn shut, week goes by, then stitches removed and weight put in eyelid to help shut, still dealing with this, 2 months into this now on Sept 3 she started to hear severe ringing in her head, and I mean loud. It has not stopped to this day 10-22-16. Imagine going to a super loud rock concert and the drummer is banging on the drum and never stops and this high pitch sound is there constant and it never stops, It is driving her crazy. I have taken her back to the doctors and we have no answers. She wants it out and I am seeing this as coming to this the point that we have to try and get it out. It has been almost 2 month of ringing, with only 18 hours that it did not ring. This is Torture!! She is a sweet 61 year old lady, and now is stuck in her apartment being tortured every day. This is not worth the chance for hearing, not when what you are hearing is ringing non stop. Please don't try this device, they never mentioned tinnitus as a possibility. She would rather be deaf than hear like this. We are going to have to do something soon because she cannot go on like this. I do not think the doctors understand how horrible this is for her, they are not in her shoes. It is better to be deaf, trust me on this, I am watching her suffer and can do nothing to help her. She was deaf in both ears most of her life with only 20 percent hearing in each ear using hearing aids and we would take that back in a heart beat. If we only knew ahead of time. We would NEVER have done this. Please don't do it I beg you for your loved ones sake so not let this happen to another soul. Crying ever day over this. Looking for answers to fix this, Bless anyone one else who is going through this. You must stand up for yourself and be strong. I AM 46 YEARS OLD AND HAVE BEEN IMPLANTED FOR ABOUT 4 MONTHS. I STILL HAVE SWELLING AND PAIN WHERE THEY CUT BEHIND EAR AND WHERE THEY PLACED DEVICE. IT IS SO BAD I CAN NOT WEAR THE PROCESSOR BEHIND THE EAR BECAUSE IT IS NOT POWERFUL ENOUGH. I HAVE THE CLIP ON PROCESSOR WITH MAXIMUM AMOUNT OF BATTERIES AND THIS PROCESSOR ONLY LAST ABOUT TEN HOURS AND I HAVE TO CHANGE THE BATTERY. I HAVE BEEN ON ANTIBIOTICS TWICE AND JUST HAD ANOTHER CT WITH DYE TO SEE WHAT US GOING ON. I HAVE BEEN TOLD THAT THE CT IS NORMAL BUT AM NOW BEING REFERRED TO INFECTIOUS DISEASE. DOES ANYBODY KNOW WHY. HAS ANYONE ELSE EXPERIENCED ANYTHING LIKE I AM HAVING TO DEAL WITH. I AM STRONGLY CONSIDERING HAVING IT REMOVED AS THE HEADACHES AND SWELLING AND PAIN ARE JUST TOO MUCH. ANY HELP IS APPRECIATED. My sister had the implant done July5 and Sept 5 the tinnitus started, she is living in Hell, The ringing and whistling will not stop, 24 hours a day she puts up with this, Lack of sleep and the ringing is driving her crazy. She is 63 and has no hope at this point . I wish we looked more at what other had problems with before we started this, She got facial paralysis after surgery too. I would never ever tell anyone to get this done. The doctor does not want to remove it We can only pray at this point no help from the doctors . My daughter had cochlear implant 20 yrs ago. She's had issues on and off for past year with extreme head pain. She was born profoundly deaf but wasn't implanted til she was 4. Mostly everything we were told then is the opposite now. She isn't wearing implant and they are telling me her head pain is because internal device is leaking and needs removed. They are wanting to re-implant at same time. I've been trying to get info on all of this. Doctors make you feel like it's no big deal but it is. She's in extreme pain and I'm scared and I don't know what to do. We live in Ohio and there is only 1 doctor but he also does other surgeries. I want to find implant only doctor or at least talk with them. She was in hospital because of extreme pain , she's home now and we have appointment Tuesday to discuss options. I want to be prepared before with as much info. Hey I have a Cochlear Implant and I've had for 1 year and 4 months now but now I don't want it anymore, so what do I do now, I don't want to ask my mom to make an appointment to see my audiologists and ask to remove the cochlear implant because then they both are just gonna start questioning me bout everything then I feel like I'm gonna say forget it and I honestly don't want the cochlear implant anymore. So what should I do?